Gregory John Skocik died on December 10, 2013 at the age of 82. 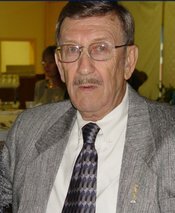 A Veteran of the Korean and Vietnam Wars, Mr. Skocik served in the U. S. Army from 1950 - 1953 and served in the U. S. Air Force from 1954 - 1972. He was the recipient of the Bronze Star. Mr. Skocik retired from the U. S. Air Force in 1972 settling down in Alabama. He was an evening administrator at Lloyd Noland Hospital. He then was a store manager at an Eckerd Drug Store and a Big B Drug Store, and also personnel manager at Big B Drugs. When he retired from Big B he accepted a position with Southern Druggist. He then attended Bessemer Tech. College graduating with an Associate Degree in Accounting. As an active member of the Knights of Columbus Council 10567 and Bishop Joseph A. Durick 4th Degree Assembly 2399, Mr. Skocik served the Council as Financial Secretary and was a longtime member of the First Degree team. He also served his God and his church as a member of St. Patrick Catholic Church in Adamsville, as a Lector, Eucharistic Minister and a member of the Parish Finance Committee until his health forced him to resign. He was predeceased by his parents, John Skocik and Pauline Bubonish Skocik and his sister, Marion Skocik Koveleski. He was survived by his wife, of 48 years, Anita Cloutier Skocik, several nieces and nephews, Funeral Services were held at St. Patrick on Friday, December 13th. Entombment followed in Elmwood Cemetery Mausoleum. Editor's Note: We welcome any contributions to this page from any friends or family of our brother Knight Greg Skocik. If you were one of the many who celebrated the life of Mr. Skocik and you have any comments or stories about Greg that you would like to share, please e-mail Louis J. Muro. We also welcome any photos of Greg that you might have. To send an e-mail to Mr. Muro to submit comments, click here to go directly to his contact page.